The key to a smooth introduction is to ensure that the cat doesn’t feel threatened. Dogs are natural predators of cats, so unless they’ve had prior positive experiences with dogs, all but the most laid back cats will feel threatened by the introduction of a new dog. The way in which the two pets are introduced can have a significant effect on their future interactions, so it’s important to do the right things when you first put the two animals together. There is a risk that the dog will attack the cat. 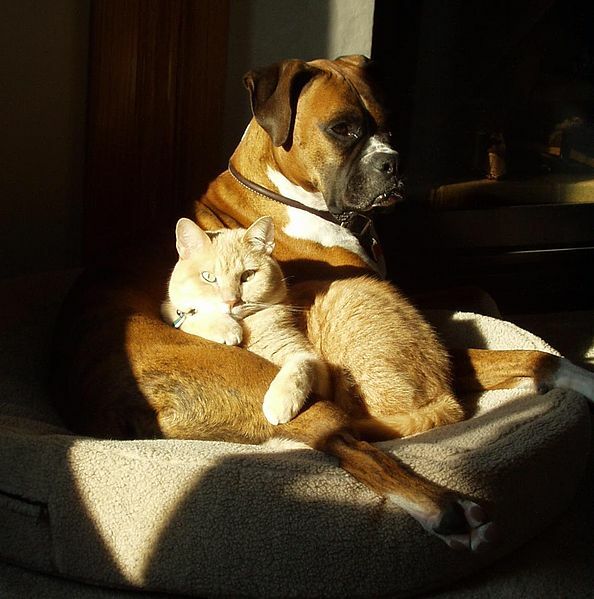 Dogs that have lived with cats previously usually get along well with them, but a dog with no prior cat experience may behave unpredictably. In the case of a puppy under 3 months old, the risk is relatively low, but with a bigger dog, you’ll need to ensure the cat’s safety. If you’re adopting a dog from an animal shelter, you can request that the staff check the dog’s behaviour around cats before you make your final decision. If adopting the dog from another owner, ask the owner about any prior interactions the dog has had with cats. Ideally, the dog has lived with cats before, has a gentle nature, or is very young. A dog that has been raised with cats is unlikely to attack them. If possible, start with a trial adoption to make sure that the dog is not inclined to be violent toward your cat before making a final decision. Keep the two animals separate until they are used to one another. Use a baby gate or some other type of barrier to confine the dog to one area of the house or apartment – a room or two. This will enable the cat to take the initiative in approaching the dog, which is important, as the cat is the one that will feel threatened. Once the cat comfortably approaches the dog, the gate or barrier can be removed, but the first interactions should be supervised. Monitor their behaviour together during the initial meetings. Don’t let the dog bark, chase, or lunge at the cat, as this could destroy the potential for a good relationship. Use a short leash if the dog is excitable and watch the situation closely. Attacks can happen swiftly, and because she is much smaller, the cat can be seriously hurt during a brief scuffle. The cat will usually only attack if the dog corners her, so preventing the dog from cornering the cat will reduce the likelihood of the dog getting scratched. In a worst case scenario, the cat may scratch the dog’s eyes, but corneal lacerations, when treated by a veterinarian, usually heal without any permanent effects. When stopping the dog from chasing or barking, use commands or restrain him gently (don’t punish the dog because this can create a negative association). Similarly, the cat shouldn’t be punished for growling, hissing, or swiping at the dog, as she will develop negative feelings about the dog as a result. Reward both pets with treats and praise for interacting positively or even just being in the same room without behaving negatively toward one another. Don’t leave the dog and the cat alone together until you’re sure they’re completely comfortable with one another. Dogs and cats can become the best of friends as long as the introductions are handled carefully. If you have a resident dog and the cat is the newcomer, all the same strategies should be used. The main difference is that the resident dog has established his territory and may guard food and other elements within this territory, which could present a risk to the cat. In this case, the dog should be retrained, if possible, to share his space. If this doesn’t work, the animals may need to be permanently kept apart using a gate or other barrier. However, most cats and dogs can learn to peacefully share a territory. ASPCA Virtual Pet Behaviorist. (2012). “Introducing Your Cat to a New Dog.” ASPCABehavior.org. Feinman, J., VMD, CVH. (1997). “Introducing New Pets to Resident Pets.” HomeVet.com. Ohio State University College of Veterinary Medicine: (2008). “New Pets.” IndoorPet.OSU.edu.